Girls Varsity Soccer Raising Money for Embrace Your Sisters. 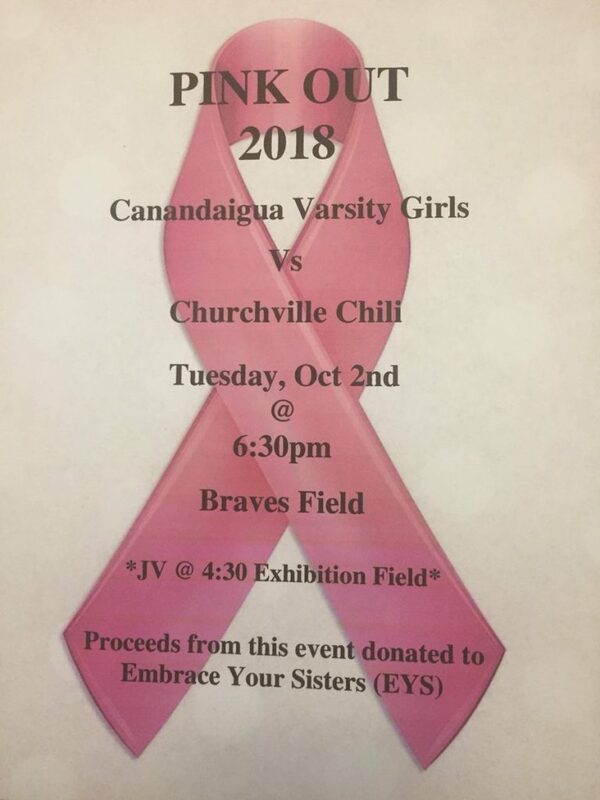 Canandaigua Academy’s Girls Soccer will be having their annual Pink Out Game on Tuesday, October 2nd at 6:30pm vs Churchville Chili @ Braves Field. All proceeds from this event are donated to Embrace Your Sisters(EYS). The bulk of the money collected for EYS comes from the sale of ‘Pink Out’ T-shirts that are funded by local community sponsors so that all of the money collected goes to EYS. The players participate by helping sell the shirts at school to students and faculty. In addition to shirt sales for raising money, the night of the game we have Raffle Baskets, 50/50 raffles, and Baked Goods table donations. Last year’s Pink Out event raised $3813.59 for Embrace Your Sisters.